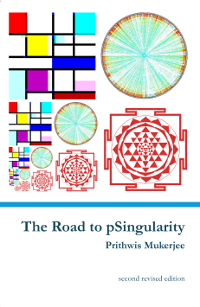 A key challenge in building the "Internet of Things" is to be able to connect a device to a computer over the internet and to use as simple and lightweight an infrastructure as possible. 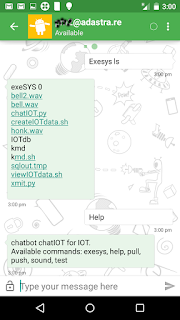 In this post we demonstrate how a public XMPP chat server can be used to transmit data and commands from one device to another using a chat client at one end and a python "bot" sitting on the other end. We will demonstrate the ability to INSERT data into an SQLite database, SELECT records from the same, play a variety of .wav files and execute any system commands on a "central" machine from any distant machine that supports an XMPP chat client. Before starting on this exercise, we searched the web for prior activity in this area and we came across this webpage that suggests a similar approach for controlling devices over the internet, but the strategy explained here is simpler to code and implement. 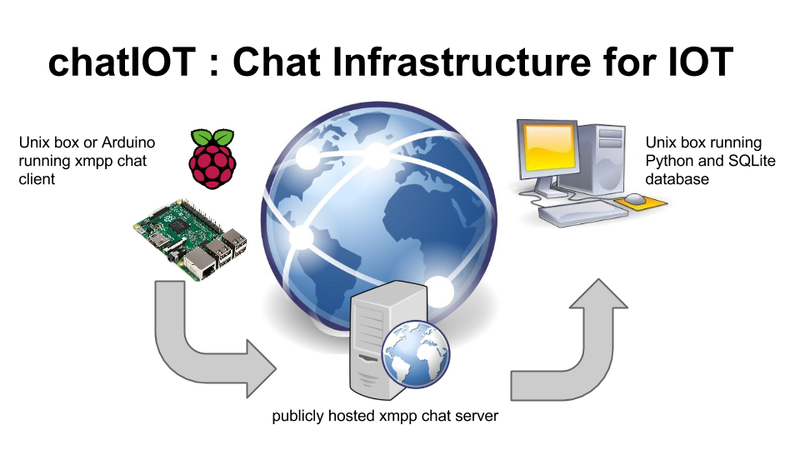 We looked for a list of public XMPP chat servers and selected the Ad Astra service, perhaps because it was the first on the list! We next registered two userids, say x1@adastra.re and x2@adastra.re to be used on the two different machines using the web-registration form, because the in-band registration does not work! We next installed the Pidgin chat client on two different Ubuntu machines and verified that text messages where being sent and received through the Ad Astra server without any problem. Since working with two machines on a desktop is difficult, we configured our experimental setup as one Android phone acting as the distant machine and an Ubuntu 14.04 laptop acting as the central server. 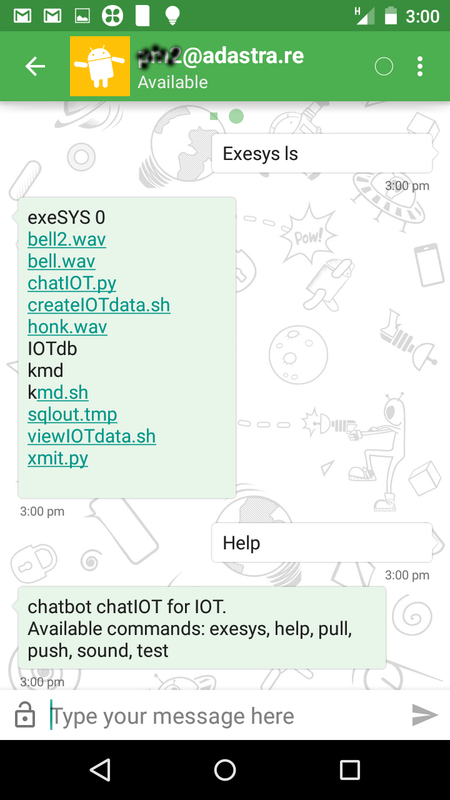 Commands transmitted from the Android phone using the Xabber chat app would be received on the server and acted upon. These tasks were to be executed by calling a shell program and passing the relevant parameters through the python subprocess command. HELP - that lists all the possible commands. Before the chatbot starts, we need to install SQLite, create a database and within it, an rdbms table. The chatbot ("chatIOT") is a python script that needs to be started with the userid@servername.com and the password as the parameters. 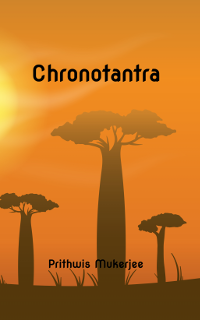 It then listens for text messages and responds as appropriate to the six commands listed above. 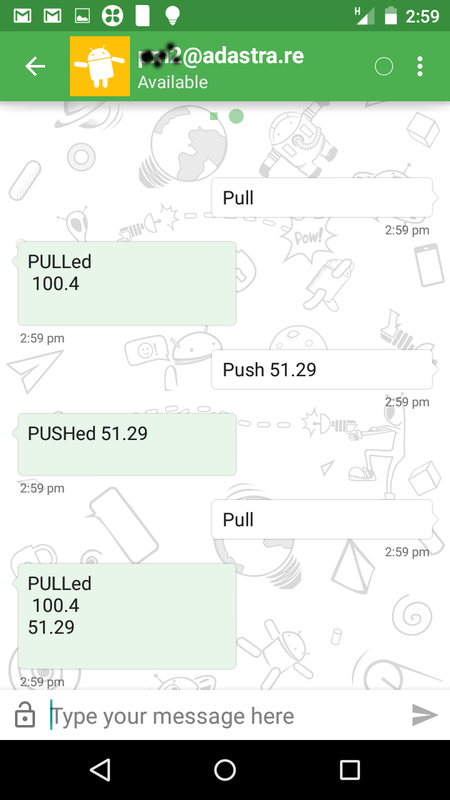 In the left hand image of a screenshot of the Xabber client on the Android phone, we see that the value PULLed from the database is 100.4. 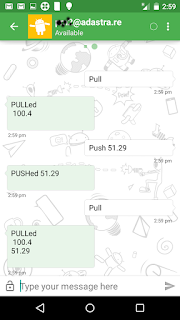 Then we PUSH 51.29 into the database and the subsequent PULL shows two values namely 100.4, 51.29 that were stored in the persistent database. The second, right hand image, shows how the unix command ls for directory listing is executed and the data is returned. We note the three .wav files that could be played by sending the SOUND command along with a number that indicates which file is to be played. How realistic is this setup in simulating a real IOT scenario ? 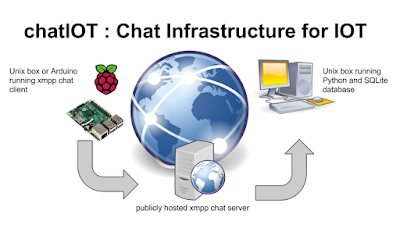 If one is not comfortable with messages being transmitted through a public chat server then one can build one's one chat server using the free and opensource OpenFire software and host it on a secure but publicly visible IP address. But even otherwise the usage of standard userid, password mechanism of a public chat server offers decent security. What we have demonstrated in this exercise is how to build a secure data transport mechanism using publicly available components and with minimal programming. IOT developers and enthusiasts can focus on the behaviour of the edge devices without having to worry about the "plumbing" that will move the data from one machine to another. the main python "bot" script, chatIOT.py and the shell script kmd.sh that is called by chatIOT.py to execute the SQLite and sound commands.